Many of us have had a basement debacle in the past. 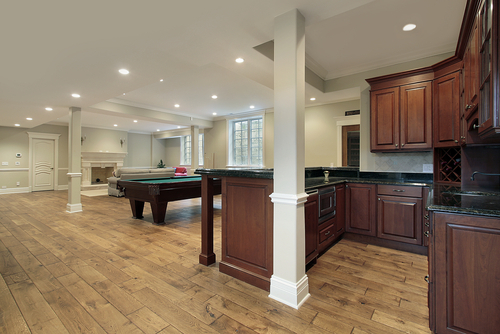 Whether you are refinishing one or being tested by an issue with moisture, we would like to offer up a heaping helping of Basement Flooring Options. Here you will find a fair and unbiased comparison of options that you can choose for your basement. So without further adieu lets jump into the Pros and Cons of each basement option. Hardwood Floors – Hardwood flooring is one of the most sought after flooring options in home’s around the world. This is for good reason, it is durable, beautiful and will typically outlast any other flooring surface with the exception of marble and stone. But how does it fair as a basement floor? Hardwood Pros: Hardwood floors are the most popular choice of floors for people who are buying a home. 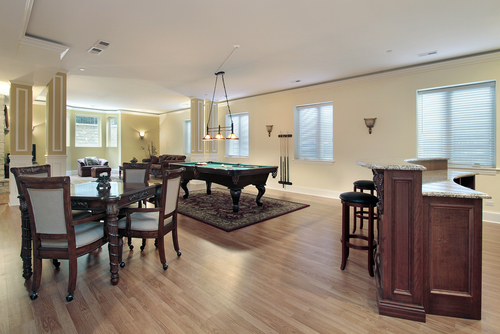 The charm and elegance of a hardwood is simply incomparable to other options. Many hardwood floors can last longer than your lifetime if the proper care is taken. If this floor ever becomes dull or scratched, you can always refinish it. Hardwood Cons: They are highly susceptible to water damage, especially when the source of moisture is below the flooring itself. Hardwood flooring is very expensive compared to other choices. It is also a little on the advanced side for DIY floor installation, not to mention most wood choices are not meant to be installed below the grade level of your home. Laminate Flooring – Laminate flooring may surprise you in the basement. It boasts all the looks of both hardwood and tile, while keeping to its manufactured roots and displaying a more impressive resistance to moisture and while remaining incredibly simple to install yourself. 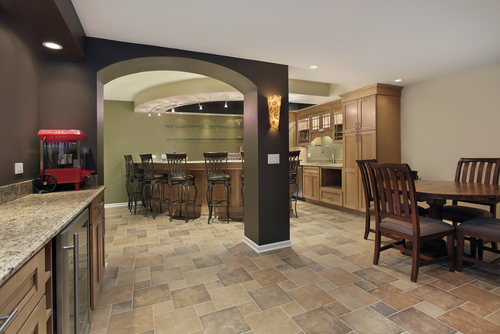 Laminate Pros: Laminate really is an excellent option for the basement. A much needed boost to durability assures that it doesn’t scratch easily. It is incredibly simple to install. It has incredible moisture reduction potential. Laminate Cons: The problems with laminate flooring lie in the very process that makes it so special. It isn’t completely real wood flooring. For some this is a complete turn off. The potential ROI if you sell your home is also lower than other flooring choices. Vinyl Flooring – Vinyl Flooring is typically a type of flooring we choose when shopping on a budget or seeking an easy to install and care for flooring option. It is however, a sound option for basements. Vinyl Pros: Really vinyl is mostly pros in a basement. It will stand up to anything and has the best moisture resistance, especially when in sheet vinyl form. It doesn’t stain easily and will last for a long time given the proper installation and maintenance was performed. This is one of the most affordable flooring choices for any space. Vinyl Cons: Aesthetically speaking, vinyl doesn’t really scream expensive. It is often easier to tell that it is vinyl and not the material that it is replicating. Careful attention to the quality of the installation products, such as adhesives, is an important part of installing it properly. Blinded by the Light: High or Low Gloss Hardwood Flooring? Bored of Your Boards? Fun and Interesting Tarkett Flooring Designs!